Does The Color Purple Represent Anything When Used In The Bible? 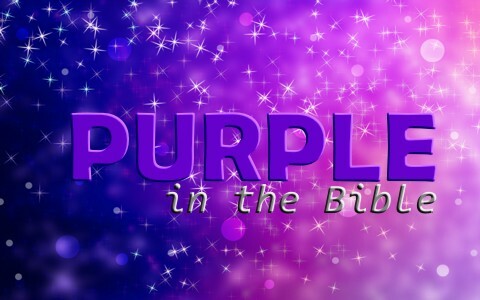 What does the color purple represent in the Bible? Purple is a mixture of blue and red. Blue is sometimes associated with the law or commandments of God and red is associated with war, blood, and judgment but the color purple has almost always been associated with royalty. Purple is very important in the accessories in the ancient temples of Israel including the curtain of the tabernacle, the veil of the tabernacle, the ephod of the high priest, the girdle that the high priest wore, the breastplate of the high priest and even the hem of the priests robe. Purple is even the color covering the brazen altar so we know from history, both biblical and secular history, that purple is the color most often associated with royalty, the rich, mystery and piety, It was even worn by Roman magistrates. And the imperial color worn by the rulers of the Byzantine Empire and the Holy Roman Empire was purple and even in Japan the color is associated with the color is traditionally associated with the Emperor and aristocracy. Purple is mentioned fifty-three times in Scripture and so it must obviously play a prominent role in the Bible. For example, the harlot “woman was arrayed in purple and scarlet, and adorned with gold and jewels and pearls, holding in her hand a golden cup full of abominations and the impurities of her sexual immorality” (Rev 17:4) and the city of abominations displayed purple throughout the city (Rev 18:12, 16) so purple doesn’t necessarily mean righteousness or royalty but we know that purple is also associated with the rich as in the story of Lazarus and the rich man where it mentions that he “was clothed in purple and fine linen and who feasted sumptuously every day” (Luke 16:19) as compared to the poor man Lazarus who was in rags. Even in the antiquities of the Jews the kings of the world wore purple, including the “Assyrians, warriors clothed in purple, governors and commanders, all of them desirable young men, horsemen riding on horses” (Ezk 23:6b). The cost of the dye needed to make the color purple was exceedingly expensive and time consuming and so purple was only reserved for the rich or royalty as “purple garments worn by the kings of Midian” shows (Judges 8:26) so purple has almost always been the color of a dignitary, a rich person, and particularly a king. The Roman’s must have known this too which explains why they mockingly put a purple robe on Jesus as they led Him out to be crucified (Mark 15:20) but the Jews must have also seen the irony in this, however the Roman’s probably didn’t know that Israel was commanded to “make the tabernacle with ten curtains of fine twined linen and blue and purple and scarlet yarns; you shall make them with cherubim skillfully worked into them” (Ex 26:1) and they are to “make a screen for the entrance of the tent, of blue and purple and scarlet yarns and fine twined linen, embroidered with needlework” (Ex 26:26). Purple was so prevalent in the temple because God wanted Israel to recognize that the greatest royalty of all is God Himself. The temple displayed purple in multiple places to remind them of the fact that God is the sovereign King over all the universe. When Daniel was elevated to third in command or rank in the Kingdom of Babylon, King Belshazzar told Daniel after he interpreted a dream that “you shall be clothed with purple and have a chain of gold around your neck and shall be the third ruler in the kingdom” (Dan 5:16) and so “Daniel was clothed with purple, a chain of gold was put around his neck, and a proclamation was made about him, that he should be the third ruler in the kingdom” (Dan 5:29) so purple is associated with the rich, with royalty, and with authority which is why Belshazzar clothed Daniel in purple. The same thing happened to Mordecai when “Mordecai went out from the presence of the king in royal robes of blue and white, with a great golden crown and a robe of fine linen and purple, and the city of Susa shouted and rejoiced” (Esther 8:15). Jesus Christ is coming again to judge the world in righteousness and anyone who has not repented and trusted in Christ will have the judgment of God upon them (Rev 20:12-15) and the eternal destiny of all who live in sin will be forever sealed (Rev 21:8). The Mighty God is coming again and even though the nations of the world “will make war on the Lamb…the Lamb will conquer them, for he is Lord of lords and King of kings, and those with him are called and chosen and faithful” (Rev 17:14). At Jesus’ Second Advent, it will be said that He has “made us a kingdom, priests to his God and Father, to him be glory and dominion forever and ever. Amen” (Rev 1:6). Today is your day of salvation (2 Cor 6:2). There is no time to delay since someday, perhaps soon, it will be said: “Behold, he is coming with the clouds, and every eye will see him, even those who pierced him, and all tribes of the earth will wail on account of him. Even so. Amen” (Rev 1:7). More about colors in the Bible: Do Colors Have Special Meanings When Used in the Bible? Who wrote this article: The Color of Royalty? Please let me know who is the author? Hello Jacquelyn. I wrote this but its not called “The Color of Royalty” but Does the Color Purpose Represent Anything When Used in the Bible? Next post: Where Does ISIS Fit Into Bible Prophecy?